Bathrooms are going to the dark side with designers moving away from all white bathrooms, in favor of matte black, dark blues like navy, and darker stains like deep chestnut and espresso. These deeper hues are being incorporated in cabinetry, painted walls and floor and wall tiles. Pair them with softer hues and warm metals to create a balanced, yet bold, look. Brass is back, along with bronze, copper and even satin nickel for a softer take on the trend. Designers suggest pairing warm metals with bold, contrasting colors such as black or dark blue or even bright white as a great way to make the metals pop. Introduce warm metals in plumbing fixtures like faucets and shower heads, as well as lighting and cabinet hardware. 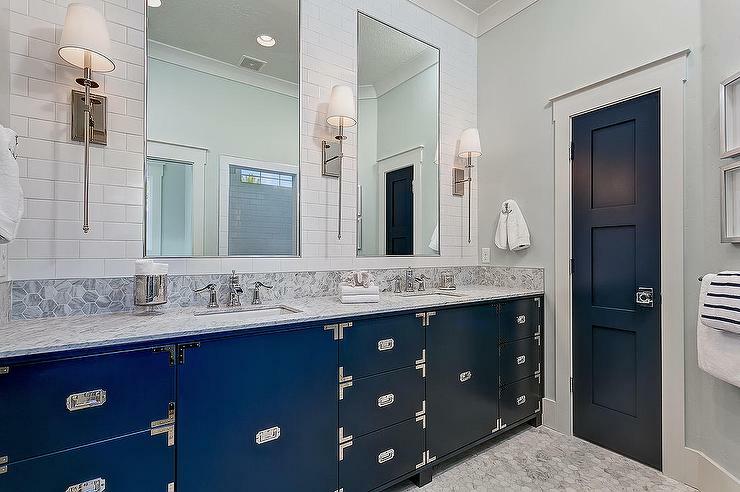 Subway tile has been the must-have look in trendy bathrooms for some time now. As homeowners move toward lower maintenance bathrooms, however, larger tile is gaining in popularity. Smaller tile means more grout lines and more cleaning. 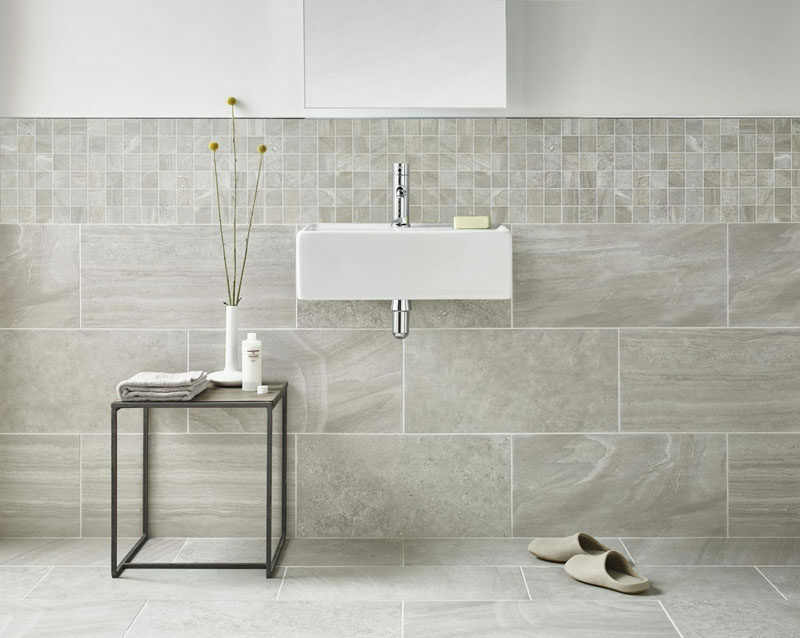 For homeowners who want tile but without all the fuss, they’re opting for larger format tiles to reduce the amount of grout needed. Not to mention larger tiles make a bold, beautiful design statement! There used to be a time when granite was the only word you'd hear when it came to designing dream kitchens and baths. According to the National Kitchen & Bath Association’s most recent trend report, however, interest in quartz is on the rise, while granite is declining. Why’s that you may ask? Quartz is an engineered stone, a combination of about 90-95 percent ground quartz stone and the rest polymer resin. It’s super durable and resistant to stains and scratches. Quartz looks and feels like natural stone, but because it’s manufactured it comes in a wide range of colors and with greater consistency. Quartz requires no maintenance, which means it doesn’t need to be sealed. Finally, quartz isn’t porous like granite, so bacteria isn’t absorbed, an important factor in a bathroom countertop! Vanities are no longer just about vanity. 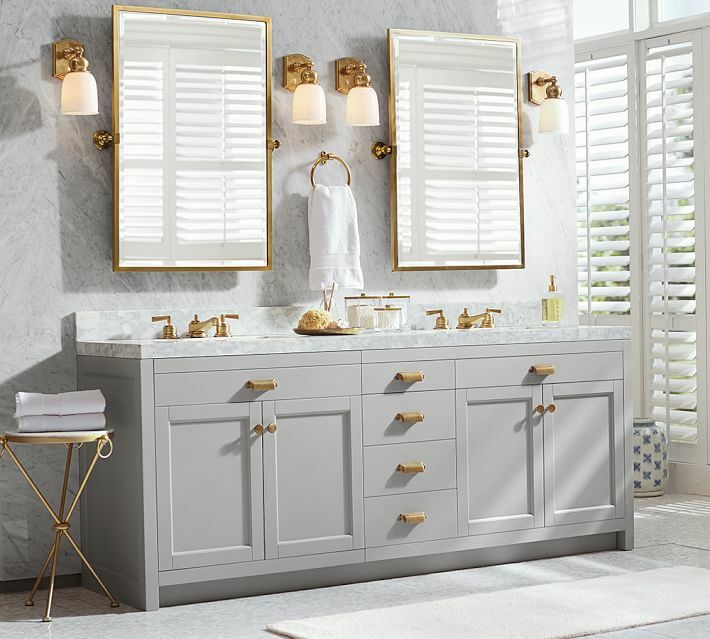 Vanity designers are responding to the way we use bathrooms and vanities today. Drawer organizers, roll out shelves, and built-in laundry hampers are just a few of the many custom storage solutions available today. Some new vanities are incorporating electrical outlets inside drawers to keep hair dryers and other equipment plugged in, but off your countertop. To stay on top of new bathroom design ideas from Michigan home builders like Evergreen Homes, visit our bathroom photo gallery. Or for more information on building a new home, download our free eBook entitled Custom Home Guide.